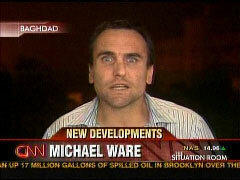 --Correspondent Josh Levs on left-wing short filmmaker Max Blumenthal, Newsroom, CNN, July 30, 2007. Moderator Gwen Ifill: "The disagreement is over the federally funded State Children’s Health Insurance Program. Congress would like to double the number of children covered. The administration says that would simply cost too much. So is this all going to come to a head in a presidential veto, David?" 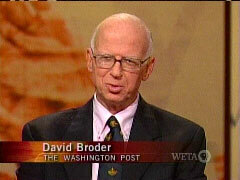 Washington Post’s David Broder: "Well, the President has threatened the veto, and everybody I’ve talked to in the administration this past week says take that threat seriously. He’s on possibly the worst possible domestic issue to which to threaten the veto. I mean, who can be against providing health insurance for kids?" — PBS’s Washington Week, July 27, 2007. --MRC President Brent Bozell on New Republic’s “Baghdad Diarist” Scandal, Hannity & Colmes, FNC, July 24, 2007. MSNBC’s Chris Matthews: "Russ Feingold wants to censure the President, the Vice President..."
Left-wing filmmaker Michael Moore: "Good idea....Personally I’d like to see a perp walk coming out of the West Wing of the White House." Matthews: "Do you think they’re guilty of war crimes?" Moore: "Absolutely....I think we need a trial, in this country, where Mr. Cheney and Mr. Bush would be brought up on charges for causing the deaths of so many people...."
Matthews: "It’s interesting if you go back....the Nuremberg Trials weren’t about the genocide, it was about waging an aggressive war. I love reading some of that language. It’s interesting." 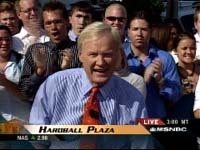 — MSNBC’s Hardball, July 23, 2007. "Hello, America. Hello, presidential candidates. This is Will from Boston, Massachusetts. And I hope, you know, they put this question on. It's a question in the back of everybody's head, you know, some people further back than others, collecting cob webs, but is African-Americans ever going to get reparations for slavery? I know y'all gonna run around this question, dipping and dodging, so let's see how far y'all can get." "I'm worried about the amount of time given to evangelical concerns, while secular voters are more or less getting snubbed. Am I wrong in fearing a Democratic administration that may pay lip service to be extremely religious as much as the current one?" -- YouTube User Stephen Marsh of Thousand Oaks, California, CNN, July 18, 2007. "The fact that al Qaeda has reorganized itself through the war in Iraq that America handed it on a silver platter...is old news. 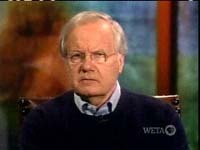 We saw that happen back in 2004.....We must be aware of the spin — the smoke and mirrors from the administration, trying to reshape the message on Iraq being specifically about al Qaeda, America’s lingering, most familiar fear, trying to invoke some Pavlovian response from the American public, to fear them into again supporting the war. That doesn’t quite hold water." — Correspondent Michael Ware The Situation Room, CNN, July 17, 2007. Kiran Chetry: “Environment also something that’s big. As we talked about, this is a younger demographic. In poll after poll has shown that younger people view environmental concerns and global warming as a major problem, so let’s listen to this YouTube question from Barbara Gonzales"
Did Good Morning America physically remove a man who appeared to be dozing off during Democratic Senator John Edward's "town hall" meeting on Monday? Early in the 7am hour, the man appeared to be sleeping, or at least dozing, while Edwards discussed his plan for Iraq. Around 7:11, the individual, who was seated to the back and right of Edwards, mysteriously disappeared. -- Good Morning America, ABC, July 16, 2007. "When September comes, you can count on more appeals for delay or excuses. That’s the formula for perpetual war — what our Founders most feared, because it would turn our Constitution on its head, throwing off the checks and balances so crucial to liberty, and leaving all power in an imperial executive....Impeachment hearings are one way to go....In the meantime, those of us in public television have an obligation to make sure viewers like you stay in the loop....When we broadcast teach-ins on the Vietnam War, and the Watergate hearings during the trial of Richard Nixon, it was a real public service — the reason PBS was created. We should keep Iraq in prime time every week — the fighting and dying, the suffering, the debate, the politics, the extraordinary costs. It’s months until September. This war is killing us now, body and soul." — Host Bill Moyers, Bill Moyers Journal, PBS, July 13, 2007. -- CNN’s Jack Cafferty, The Situation Room, CNN, July 12, 2007. Some foreign policy experts predict that such a U.S. withdrawal could unleash genocide against innocent Iraqis. It's a subject Democrats do not want to discuss. -- ABC’s Jack Tapper, World News, ABC July 12, 2007. "You know, I wanted to sit on a jury once and I was taken off the jury. And the judge said to me, 'Can, you know, can you tell the truth and be fair?' And I said, 'That's what journalists do.' And everybody in the courtroom laughed. It was the most hurtful moment I think I've ever had." -- ABC’s Diane Sawyer, Good Morning America, ABC, July 12, 2007. --MRC President Brent Bozell, Hannity & Colmes, FNC, July 9, 2007. NBC’s Ann Curry: "Live Earth involves 130 countries, 7 continents, 2 billion viewers, dozens of bands and it’s all in a day’s work for this man, who’s worked tirelessly to raise the issue of global warming, the Chairman of the Alliance for Climate Protection, Al Gore. Al, good evening. You know, you’ve been pouring yourself into this issue, I mean, I gotta tell you, you’ve exhausted yourself....Nevertheless you keep pushing and actually the question is, what constitutes success here?" Former Vice President Al Gore: "...We are now prepared to announce formally that this is now the largest global entertainment event in all of history." Curry: "Whoa!...Congratulations....A lot of people want me to ask you tonight if you’re running for President.... Would you answer the call?...Have you ruled it out?...Have fun tonight. And I think you are." Gore: "Thank you very much. Thanks for what NBC has been doing." Curry: "Alright, thanks a lot." — Exchange during NBC’s three-hour July 7 broadcast of Gore’s "Live Earth" concert to fight global warming. --MRC’s Clay Walters, The Big Story, FNC, July 5, 2007. 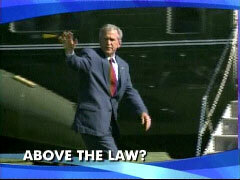 "This morning, above the law? The President decides convicted White House official Scooter Libby should not go directly to jail. He’s not going to jail at all. Was justice served?" — Fill-in co-host David Muir opening ABC’s Good Morning America, July 3, 2007. "Greatest Crime of This Century"
"Good evening. A President who lied us into a war and, in so doing, needlessly killed 3,584 of our family and friends and neighbors; a President whose administration initially tried to destroy the first man to nail that lie; a President whose henchmen then ruined the career of the intelligence asset that was his wife when intelligence assets were never more essential to the viability of the Republic; a President like that has tonight freed from the prospect of prison the only man ever to come to trial for one of the component felonies in what may be the greatest crime of this young century." 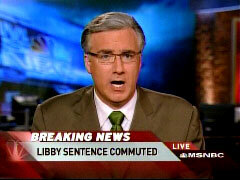 — Keith Olbermann opening MSNBC’s Countdown, July 2, 2007.